One week to go until Ontario Craft Beer Week, a province-wide celebration of Ontario Craft Beer and the brewers who make it. The fifth annual Ontario Craft Beer Week is the perfect time for everyone from adventurous consumers to curious newbies to experience the craft beer craze and meet the "Real People behind the Real Beer." A key theme of OCB Week is "Collaboration" between brewers. Many OCB members work together to make beer, hold events and build the industry. This kind of teamwork is rare in a competitive industry. OCB Week is a great time to experience this unique culture first-hand. "Ontario's craft brewing sector is growing by leaps and bounds," says Darren Smith, President of Lake of Bays Brewing Company and co-chair of Ontario Craft Beer Week 2014. "With hundreds of events in towns and cities across the province, there's no better time to get out and experience the collaborative culture and great flavours of craft beer." 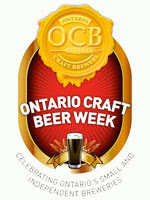 To celebrate Ontario Craft Beer Week, OCB collaborated with Black Oak Brewery of Etobicoke to create an official OCB Week beer. OCB'Wheet is a Golden Beet American Wheat made by brewers Jon Hodd & Mike Lynn at Black Oak. The Ontario golden beets were roasted first to carmelize the flavour and then added to the boil. B'Wheet is made with wheat and Vienna malt and some British hops, super Galena for bittering, East Kent Golding for flavour and Sorachi for aroma. This slightly bitter, fuller bodied wheat has nice earthy undertones, a lovely flowery hoppy flavour and will be nice on a hot day. For the fifth year running, Beau's All Natural Brewing has created annual collaboration beer, a blend of barrel-aged or strong beers from Ontario craft brewers. This year's blend will have Matt's Sleepy Time Belgian-style Imperial Stout as its base, and will be topped up with Oust House Biere de Garde (aged in Canadian oak barrels), and Sawdust City's The Princess Wears Girl Pants Belgian Golden Ale. Pan Ontario 2014 will be available at the OCB Week official launch event on Friday, June 13 at Yonge Dundas Square (11 a.m.) and at select restaurants and pubs as part of Beau's OCB week events. The ultimate collaboration of the week takes place at the Session Craft Beer Festival to be held this year at Yonge & Dundas Square (June 13, 14). Organizers at Session inspired all brewers to collaborate with an artists or celebrities to make beer for sampling during the festival. This year's 'Collaboration Nation' features 25+ of collaborative offerings including: Beau's & Margaret Atwood; Sawdust City and Citytv Meteorologist Adam Stiles, Spearhead & Sam Roberts Band, Kevin Brauch (Thirsty Traveler) & Kensington Brewery, Mill Street & July Talk, Niagara College & Chef Michael Smith, Steam Whistle & The Darcy's AND MANY MORE AMAZING PAIRINGS!! !